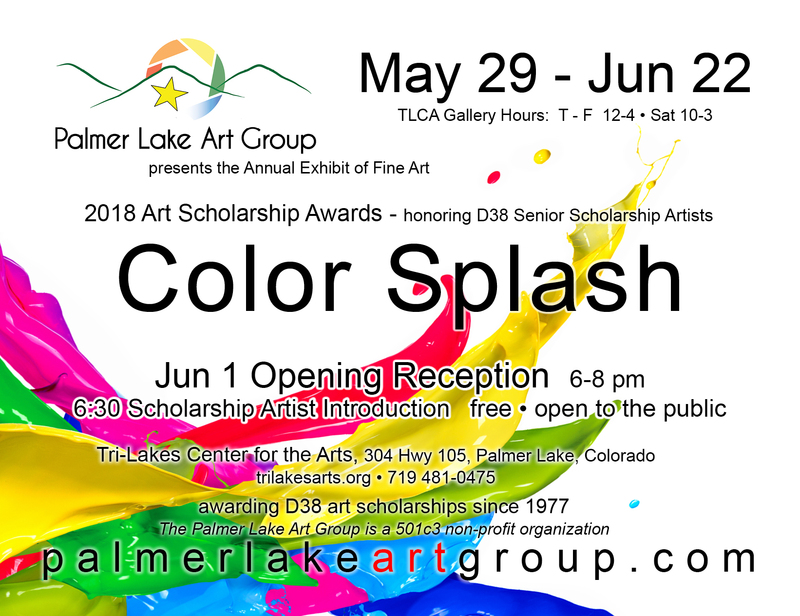 Palmer Lake Art Group – Page 13 – Where artists gather. IS IT ON YOUR PALETTE? (NOTE: The following edited article is a post by artist Dan Schultz. See the full article and photos at his web site at www.danschultzfineart.com). When I teach painting workshops, students are often surprised to discover that I use black as one of my usual palette colors. It seems that some art books have discouraged against using black, but I’ve found it to be a great addition to my palette. After graduating from college with a degree in commercial art, I still had a lot to learn about fine art painting. Around that time, I bought the brand new book Alla Prima by Richard Schmid. In the book, Schmid lists the palette colors he most often uses. I adopted most of his list and set out to learn how they all worked together. Black wasn’t a color he listed, so I learned to make it by mixing other tube colors together — a valuable lesson. A few years later, I had the opportunity to watch a live painting demonstration by Scott Burdick. He masterfully painted a portrait from a model outdoors using a limited palette. It was the first time I had ever seen anyone paint with a four-color palette. You may have heard of the four-color “Zorn palette” named for Swedish artist Anders Zorn. Scott used a similar palette that day: Titanium White, Cadmium Yellow, Cadmium Red and Ivory Black. Scott’s painting blew me away. I had no idea of the range that could be achieved with so few colors, especially with one being black. Afterwards, I set out to experiment with the Zorn palette and other limited palettes myself. I soon added Ivory Black to my regular palette after seeing the range of colors I could make with it. I continue to use it for studio painting as well as plein air painting. To manipulate paint, a brush with very stiff bristles is harder to control than a slightly softer brush.A brush that is too soft can’t control the paint either because it doesn’t have the strength to hold paint and make it go where you want it to go. Use less brush-work, but apply the strokes deliberately, using as few strokes as possible. Overworking takes the life out of a painting. Schmid targets for a styling that is loose but not sloppy.John Singer Sargent achieved looseness, but very carefully to be in complete control. Schmid keeps a ragged, old worn out Langnickle with splayed bristles that he uses to get touches of colors on trees. When working in the studio, color will look deeper and richer than it will outdoors because of the brightness of the sun outdoors on the paint. So inside, he mixes tones slightly darker and more saturated. For small areas of color highlights in finish-work, such as on leaves, don’t mix the paint too thoroughly; leave it in a variegated state. Broken color is pure impressionism. The bottom of an object, such as a door, foundation, flower pot, tree, post, etc., picks up color reflected from the ground (i.e., grass, gravel, etc.). Place that color into the object. Schmid tends to use more lemon yellow and cadmium yellow outdoors than he would indoors under north light. He sees yellow-green outdoors. Viridian and two blues (cobalt and ultra) and a variety of yellows can make any greens he wants. In this DVD, he showed his color charts and how important they can be to determining the colors being looked at in the scene to be painted. They also help confirm the color harmonies to be set in the painting. He emphasized how important it is to be able to see colors in nature. Following are some tips gleaned from a three-hour DVD titled: “WHEN YOU CAN’T PAINT OUT –Painting Landscapes from Photos in the Studio,” by oil painter Jim Wilcox. You can see his work at www.wilcoxgallery.com. Tree shadows are strongest nearest the tree and become softer as they move outward from the tree. In doing holes in trees, it’s best to do so last. The smaller holes will be darkest, larger holes match the color of what is behind (such as sky). The closest evergreens will be more colorful and highlighted. More impasto in foreground, less in background. Bigger, bolder strokes in foreground. Thicker paint in lights. Snow is usually warmer and darker than you think it is, except where the sun is at right angles to the snow. When doing snow on ground, don’t forget to include snow on trees. In snow where there is rolling land, it is darkest next to the lightest, the value changes as it moves outward from there. There are subtle things going on in the darks; look closely. For distant hills, you can achieve roundness by showing reflected color of sky at the top. Also make tops softer with a mix of sky and hill colors and also by softening edges between the hills and the sky. Using brushes: Use all edges of the brush. One friend of his did more pushing of paint with brush than pulling. But, it is more important to focus on getting the right color in the right place.Don’t paint the paint…apply the paint. Wilcox uses mostly #6 and #3 brushes. He uses several of each so he doesn’t need to clean so much, using a clean brush for different colors. For very large paintings he uses #12 or #14. What are your resolutions, if any, regarding your art for the new year? The following 10 traits are based on analysis (by professional researchers) of traits of successful business leaders. Keeping them in mind can help you in marketing your art. 1. How you think is everything. Concentrate on being positive. Ignore all negative thoughts, influences, environments and people. 2. Decide upon your true dreams and goals. Set realistic and limited targets to accomplish during the year. By setting too many goals, we usually complete hardly any. 3. Take action. Your plan won’t complete itself. Resolve to get started and to keep going, without excuse or rationalization. 4. Never stop learning. Learn new things about your craft. Read and study magazines, books and videos about your craft. Seek out artists whose work you admire and take lessons from them. 5. Be persistent and work hard. True success is a long-term, not a short-term endeavor. It can take many years to reach a satisfactory level of art achievement. 6. Stay in the details. Gather facts and information that will help you market and sell better. For example, analyze which of your pieces sell best based on subjects, sizes, formats and prices. Also learn who buys what, where and why. 7. Focus your time and energy. Don’t let distractions, chores, commitments, people or anything else distract you from devoting yourself to your art. 8. Be innovative; be different. Be daring and try different media, techniques, venues and marketing and selling approaches. 9. Deal with and communicate with people effectively. Appreciating customers and informing prospects is as important as creating the work. 10. Be honest and dependable; take responsibility. Otherwise numbers 1 through 9 won’t matter. Amen.